We list on this page items such as the Cambridge sailing alumni tie and current alumni events. You can buy or book without creating an account, using credit card/PayPal payment arrangements. So just add the item you want to your basket and you will be taken to a checkout page. There you will find full payment and other instructions. 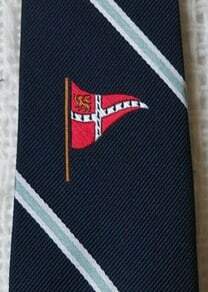 The adjacent image shows the current club tie. It is a most attractive design. The tie costs just £19 including UK postage; £21 for overseas orders (which are sent by Air Mail). It is a top-quality production from The Tie Store and comes complete with a light blue lining. If you are UK-based just click on the ‘Add to basket’ button below and you will be taken straight to a checkout page. Students should buy from team racing stash to save postage costs. If you are ordering from overseas, please use these special overseas order arrangements.